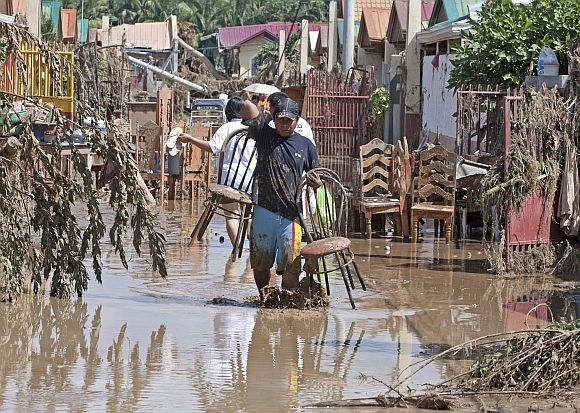 More than 500 people were killed, most in their sleep, as tropical storm Washi swelled rivers and triggered flash floods, which devastated a southern Philippine region. Unaccustomed to serious storms, the floods turning two coastal cities into muddy waterways strewn with overturned vehicles and toppled trees. With nearly 458 people missing, Defence Secretary Voltaire Gazmin and top military officials were to fly to the worst-hit city of Cagayan de Oro today to help oversee search-and-rescue efforts and deal with thousands of displaced villagers, as the weather began to clear and floodwaters receded. Among the items urgently needed are coffins and body bags, said Benito Ramos, who heads the government's disaster-response agency. "It's overwhelming. 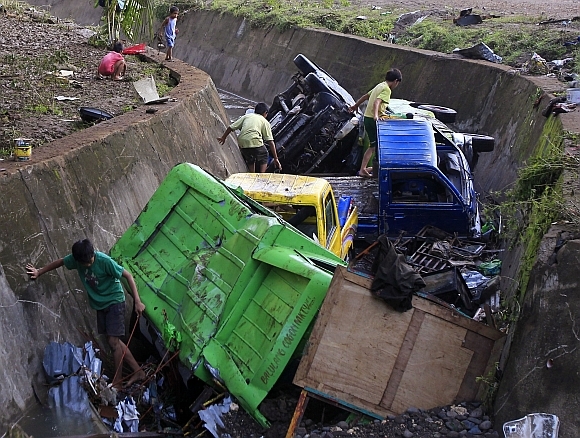 We didn't expect these many dead," Ramos said. Army officers reported unidentified bodies piled up in morgues in Cagayan de Oro city, where electricity was restored in some areas, although the city of more than 5,00,000 people remained without tap water. 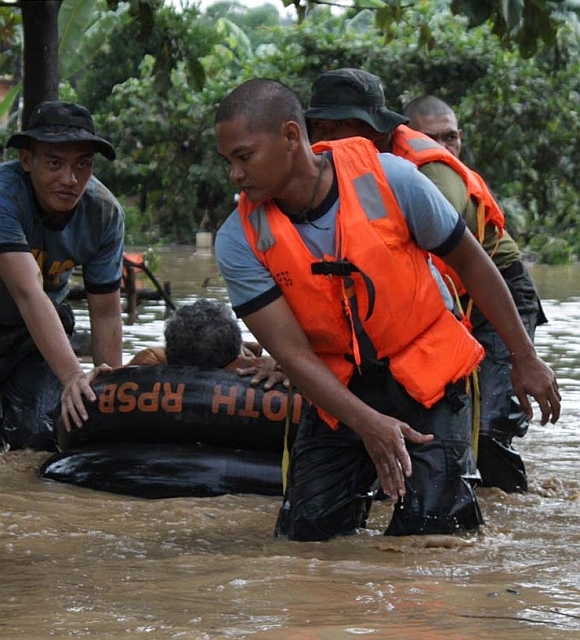 Most of the victims were asleep on Friday night when raging floodwaters cascaded from the mountains after 12 hours of rain from a late-season tropical storm in the southern Mindanao region. The region is unaccustomed to the typhoons that are common elsewhere in the archipelago. Ayi Hernandez, a former Congressman, said he and his family were resting in their home in Cagayan de Oro late Friday when they heard a loud swooshing sound and water quickly rose ankle-deep inside. He decided to evacuate to a neighbour's two-storey house. Philippine Red Cross Chairman Richard Gordon will travel to the stricken region Monday to assess the damage, according to a statement from the organisation. Pang said that the death toll would most likely rise, with 458 people still missing and many villages remaining isolated and unreached by overwhelmed disaster-response personnel. 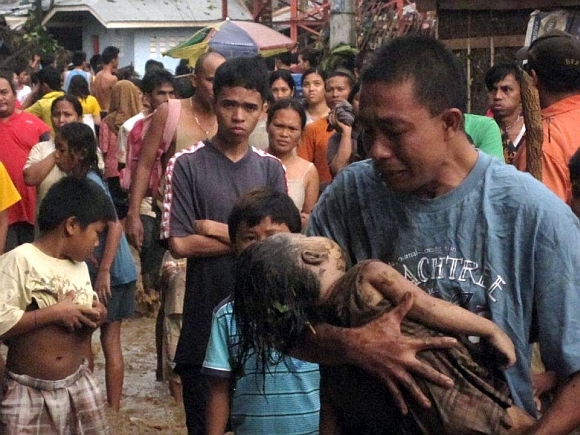 Pang says the hardest-hit cities were Cagayan de Oro city, where at least 239 people died, and nearby Iligan, where Red Cross aid workers reported 195 dead, mostly children and women. 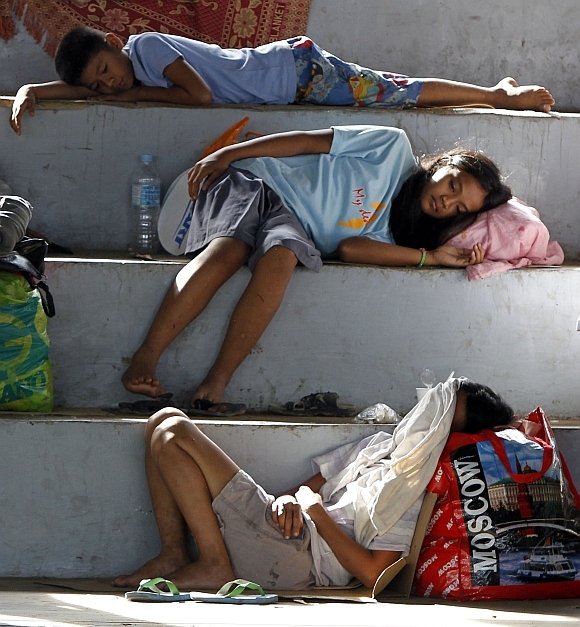 At least 20,000 people were staying in 10 evacuation centers in Cagayan de Oro, Social Welfare Secretary Dinky Soliman said Saturday. 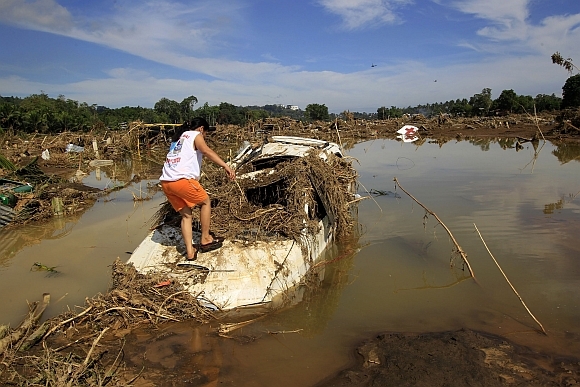 Some 20,000 soldiers embarked on search-and-rescue operations, the military said. Tropical Storm Washi started to blow away toward the South China Sea on Sunday, allowing the weather to clear and disaster-response contingents to intensify search-and-rescue work. United States Secretary of State Hillary Clinton expressed her condolences Saturday on behalf of the US government and said the United States "stands ready to assist Philippine authorities as they respond to this tragedy."